Are you in search of some Zone Diet friendly summer recipes that have real umami? Then keep reading to access some options that you’re sure to love. Wait, What Is Umami, Anyway? First off, it is important to understand what umami is. Growing up, you probably only knew about four flavors: sour, bitter, salty, and sweet. However, a lot of people feel that there is something missing form this list, and that is where umami fits right in. 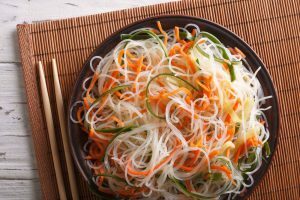 This is the flavor that can be found in seared meat, aged cheese, and hearty broth, as a few examples..
One of the many easy Zone Diet Friendly summer recipes is this rice noodle and edamame salad, which boasts seaweed for real umami. Start by cooking edamame according to the directions on the package. Drain them, rinse them off with cold water, and set aside. Then cook an 8-ounce package of thin rice noodles according to the directions on the package. Drain these and chop them twice on a work surface. Grab a cup of dulse seaweed and cut it into bite-size pieces. Next, mix ¾ cup of rice vinegar, 2 tablespoons each of sugar and canola oil, and ½ teaspoon of salt. Add in a shredded carrot and a red bell pepper that’s been sliced into thin strips. Then, add in the rice noodles, edamame, and seaweed to all of the other ingredients, along with 1/3 cup of a sliced red onion, ½ cup of chopped peanuts, and ¼ cup of chopped cilantro. Another one of the healthy and Zone Diet friendly summer recipes that you can try if you’re looking for umami is this easy stir-fry. Start by whisking together 2 tablespoons of soy sauce with 3 tablespoons of hoisin sauce and ½ teaspoon of chili-garlic sauce. Then, take some drained firm tofu and chop it up into cubes. Heat a tablespoon of oil in a skillet before adding the tofu and cooking until browned. After removing the tofu, add another tablespoon of oil to your skillet and stir in 2 cloves of minced garlic and a chopped onion, along with a tablespoon of grated ginger. After a minute, add in 2.5 cups of sugar snap peas and 2¼ cups of snow peas. Cook until they’re bright green, then add the tofu back to the pan, add in the hoisin mix, throw in ½ cup of cashew halves, and cook until heated through for a minute. Serve, and enjoy! Dig into these guilt-free, easy summer recipes to keep your beach body in shape!